Mood board: Kicking off LC:M, Craig Green’s ’neo-romantic’ spring/summer 2016 man blurred the gender divide with a show that also marked the debut of the British designer’s official women’s line. 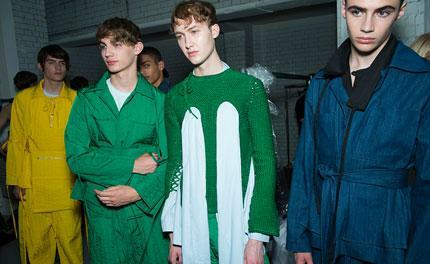 Green’s signature Judo jackets, and spit and tied Aikido pants were back with a frenzied amount of trailing straps, and all electrified by spring’s chemical colour palette of neon orange, Ninja Turtle green and sonic yellow. Team work: Having shot his first campaign with photographer Nick Knight last season, Green clearly has his brand identity front of mind and this latest collection reinforced his martial arts/utility approach, which has been brought to life within Dover Street Market’s windows for LC:M. DSM’s Adrian Joffe was in London for the day to offer front row support. Green’s (well-earned) visibility is finally reaching the saturation point of his latest collection’s hyper hues. Best in show: Given that his quilted jackets (particularly brilliant in denim this season) are already being snapped up by boys and girls alike, it made sense for this designer to explore the idea of androgyny in more ways than one. His faux breast knits for boys were the result of Green’s examination of symbols of power, and only further reinforced the unisex appeal of his clothes.